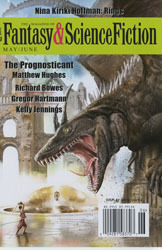 I’ve just received my contributor’s copy of the May/June 2017 issue of Fantasy & Science Fiction, and was surprised (in the best possible way) to see that my story “A Thousand Deaths Through Flesh and Stone” opens the issue. On a personal level, it’s especially meaningful to me, because it’s a sequel (and also prequel and also interquel and yes I’m being serious) to the story that changed my life. Back in 2013, I was very seriously considering hanging up my hat from the writing industry. That’s not an exaggeration. Too many rejections, too little progress. Publishing seemed to be the fortress of Angband, impenetrable and insurmountable. I had one final batch of stories making the rounds at various editor desks, and as I waited for their fates to be decided like little gladiators waiting uncertainly for the thumbs-up or thumbs-down from a presiding emperor, I found myself debating whether I would continue. That’s not to say I was going to stop writing. Yet it takes a hell of a lot of energy, dedication, sweat, blood, ichor, and stubborn determination to keep along the professional path. Your machete grows dull as you hack through the jungle. You start to tire of the flies biting you, the oppressive heat, the snakes underfoot, and the fact that your compass rarely works correctly. One by one, the stories came back with little rejections. I’d gotten into the habit of scanning through these letters and emails for one word: UNFORTUNATELY. The rest was always a blur of boilerplate words, or (more hurtfully) words of high praise that would flow cheerily along through one or two paragraphs before slamming into that obnoxious adverb. And then on a Thursday evening, December 12, 2012 at 5:15 p.m., I received a phone call from the Writers of the Future Contest. My story “War Hero” had won 2nd place. What followed was a week-long excursion in Los Angeles with industry professionals who provided invaluable field intel, insider advice, and encouragement. I got to meet fellow writers who have since become good friends. Suddenly my perspective changed. I wasn’t a lone writer trying to scale a fortress; I was part of a movement… the latest crop of speculative fiction authors who were working on contributing something meaningful to a genre that’s near and dear to us. And I took what I’d learned, and refined both my approach and myself. 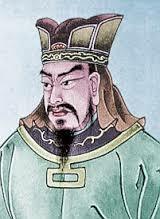 “Intelligence is of the essence in warfare,” said Sun Tzu, whose advice was then promptly ignored by the American patrician caste and their military-industrial complex. “A Thousand Deaths Through Flesh and Stone” is a continuation of “War Hero”, though it can stand fully on its own (my philosophy is that sequels/prequels should always be fully capable of independent existence.) And it also provides a satisfying trail-marker when I climb the nearest hill and stare back at the story that got me out of the weeds and onto the professional path. My “War Hero” universe is a chronicle of humanity’s expansion into the larger galaxy. It is also meant to be a contrast to the usual “let’s terraform everything to suit us” trope: I think it more likely that we’ll alter ourselves to align with the alien beachheads we colonize. Traditional definitions of humanity are bound to change as we do. “A Thousand Deaths Through Flesh and Stone” is set at the beginning of that odyssey, and therefore at the earliest iteration: what happens to individual identity when mind-uploading allows the multiplication of individuality? And it was inspired, too, by reports of SAS activities in World War 2’s aftermath, when British operatives hunted down Nazi war criminals who had escaped the trials at Nuremberg. According to the tales, the operatives would locate the fugitive, confront him or her with their true identity, and then execute them… often with the same German-made firearm that had been used against captured SAS during war-time. Filtering that through a future lens of technology and colonial expansion made for a story brimming with possibility. As it turns out, TangentOnline has given glowing reviews to three of my stories (including my F&SF appearance) this month. “Shadows and Shore Leave” by Brian Trent is a delightful tale about cloning and family dynamics, helped along with Trent’s witty and charming prose style and knack for dialogue. Darron returns home to find that he and his sister have some differences over the alien krolort. He fights them up close, she wages a battle of conscious anti-war activism against his efforts at home. The ending is rather hard-hitting yet necessary, so the reader will be left with a sense of ennui for the state of politics and its ability to rip up families. Fiction that makes the reader contemplate the state of the world is doing its job right, as it can expand our thinking. “The JPEG of Dorian Gray” by Brian Trent combines the classic gothic tale of Dorian Gray with the immortality of things posted on the internet, to great and humorous effect. Some unknown millennia in the future, long after humanity has disappeared from the Earth, the immortal Dorian Gray still roams, searching. Long before he grew tired of being immortal, camera phones were invented and Dorian made a mistake. The humor is well paced, the prose flows between the present and flashbacks easily, and the story overall is a well-crafted piece of dark humor and fantasy. Brian Trent leads off with “A Thousand Deaths Through Flesh and Stone,” a grim tale of revenge or justice, depending on one’s point of view. Humanity has inhabited many places in the solar system. The plot begins after a final act of violence at the end of a particularly horrific war has killed nearly the entire population of Mars. The narrator is sent to assassinate a war criminal hiding on the Moon. The mission is made particularly complicated by the fact that both the hunter and the prey have had their minds uploaded into multiple bodies. What follows is a fast-paced thriller with a level of violence which some readers may find disturbing. I sold my story “Jackbox” to Galaxy’s Edge, and three stories to anthologies which I’ll be able to announce (once the ink dries on the contracts) next month. This entry was posted in Blog and tagged a thousand deaths through flesh and stone, fantasy and science fiction, galaxy's edge. dorian gray, orson scott card initergalactic medicine show, Shadows and Shore Leave, tangentonline, Writers of the Future. Bookmark the permalink.